The post got lots of activity from both regulars and biology students from the University of Chicago Laboratory School, which means there were lots of helpful comments! The specimen was quite clearly from a rodent, due to the paired incisors, but there are a LOT of different rodents out there. The presence of a spiky postorbital process (see top skull) suggests that it was from a type of squirrel. 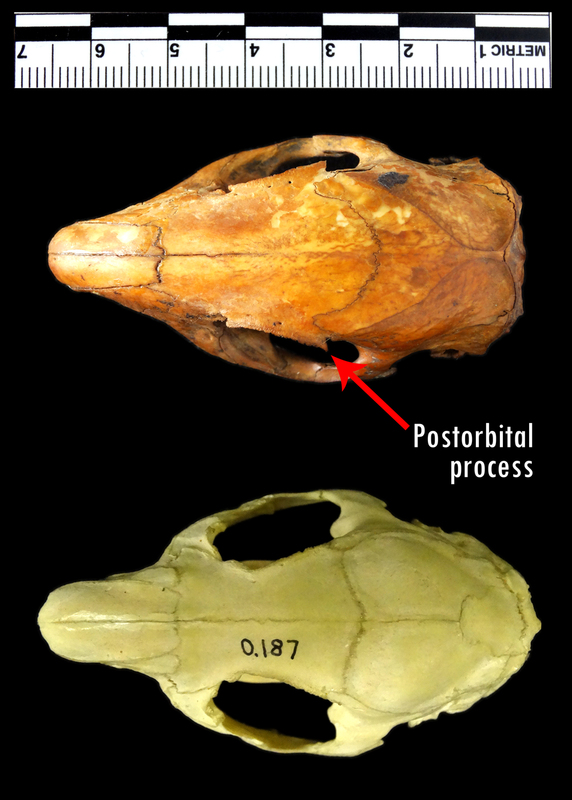 Most other rodents either lack this process (see bottom skull), or the process is more stout and blunt. Narrowing it down to a squirrel is helpful, but there are still around 285 different species to choose from and many squirrels have very similar skulls. This is where the real challenge lay, especially since it clearly wasn’t the British Red Squirrel Sciurus vulgaris or the more widespread Eastern Grey Sciurus carolinensis, as I showed you on Friday 14th. Other suggestions included the Southern Flying Squirrel Glaucomys volans (which is a bit on the small side) and Eastern Fox Squirrel Sciurus niger (which has a really interesting method you can use to identify it). The relatively narrow zygomatic breadth, combined with a relatively wide breadth between the orbits suggests a ground squirrel of some sort, which many people recognised, leading to suggestions of Poliocitellus franklinii, Spermophilus sp., Otospermophilus sp. and Tamias sp. – for which this useful reference provides some great comparative specimens (huge thanks to Crispin for sharing this). 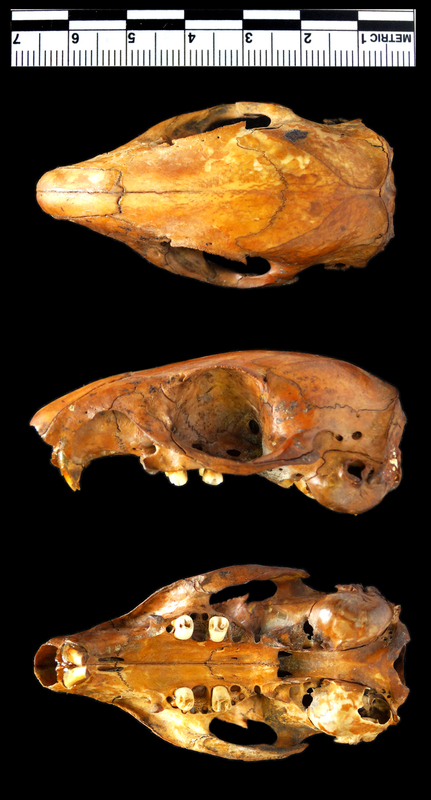 However, none of the North American ground squirrels quite matched up, with the closest suggestions of Otospermophilus variegatus or Poliocitellus franklinii still being different in a variety of ways, particularly in relation to the width of the skull, relative zygomatic breadth and shape of the postorbital process. 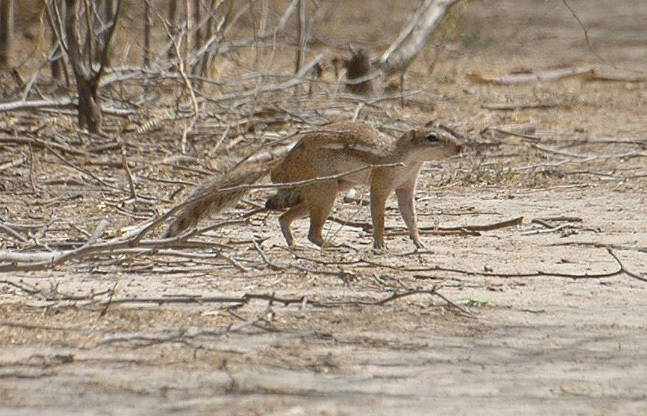 After much consideration it came to me that we may be looking on the wrong continent and it turns out that African ground squirrels are more similar to this specimen. Fortunately, there is a very useful resource providing images of specimens of African rodent species available through the Belgian Biodiversity Platform. This fantastic site has enabled me to make a reasonably confident identification of Striped Ground Squirrel Xerus erythropus (Geoffroy Saint-Hilaire, 1803). I’d still like to get my mystery skull to a comprehensive physical collection, just to make some fine detail checks (there are some issues with the shape of the posterior margin of the palate I’m not 100% happy about), but overall I’m happy with this – but please let me know if you think I’ve missed something! Too many squirrels on too many continents! Thanks Ric, I use this one a lot, but it only gets me to genus for the Xerus ground squirrels and because it only covers Tanzania it can miss some useful taxa. Still a fantastic key though! Not sure about the other North American ground squirrels, but Tamias species tend to be smaller than S. carolinensis, so I don’t think they would be good candidates for a skull of this size. Everyone is welcome to participate, no matter their level of knowledge/experience. Plus, the comment about Tamias is useful information, so your contribution is clearly beneficial! Great post Paulo – and thanks for the detailed feedback explaining the identification. Also, that pink fluorescence of the S. niger bones and even fossils is amazing! Apparently the same condition occurs (very rarely) in humans as well. Oops – I mean Paolo – sorry!